by Baron Halpenny, LincsMag Editor. There may be a game called Risk, but when it comes to doing Risk Assessments you'll find that it's no game and the consequences of getting it wrong can be severe, if not fatal. Quite simply and logically, if business/corporate people don’t know, or appreciate where the risks are in their business or work place, then they are putting themselves, their employees, their customers, members of the public and their company in danger. A risk assessment is simply a careful examination of what, in your work, could cause harm to people, so that you can weigh up whether you have taken enough precautions or should do more to prevent harm. Workers and members of the public have a right to be protected from injury caused by failing to take, at the very least, reasonable control measures. It’s obvious that accidents and ill health can and do, ruin lives and it will also affect businesses too as output is lost, machinery is damaged, insurance costs increase or the business is taken to court. Companies/businesses are legally required to assess the risks in the workplace so that they put in place a plan to control the risks. The aim should always be to reduce the risks as much as is 'reasonably practicable' and this is important to remember as 'Reasonably practicable' is a legal term that means employers must balance the cost of steps that they could take to reduce a risk against the degree of risk presented. When reckoning costs, it’s important that the time, trouble and effort required should also be included and not just the financial cost. Employers must look at all work activities that could cause harm in order to decide whether they are doing enough to meet their legal obligations. This is a minimum requirement. If it is reasonably practicable to do so, employers should consider doing more than the legal minimum. So, what should a Risk Assessment cover? It depends on the organisation of course and will also depend on the nature of the work, but whatever, Assessments must consider everyone who could be affected by that activity. Who is responsible to do the Risk Assessment must be competent to do them. Competency does not necessarily require particular qualifications but involves a combination of knowledge, skills and personal qualities. There is no doubt that a course like Singleton Associates' Risk Assessment gives valuable guidance and information and well worth taking for anyone delegated with the responsibility of completing these Assessments. In such a course, guidance and information is given to enable delegates to carry out a logical and effective risk assessment but also trainees are able to realise the limitations of their knowledge and experience and will be aware of where to seek further information, guidance and assistance. So if you have a company or delegated to complete Risk Assessments, don’t take it lightly because when it comes to the law and Health & Safety, should something go wrong, you are guilty until you prove yourself innocent ... then you’ll see all those forms and Assessments are very important to you and that they were done correctly. 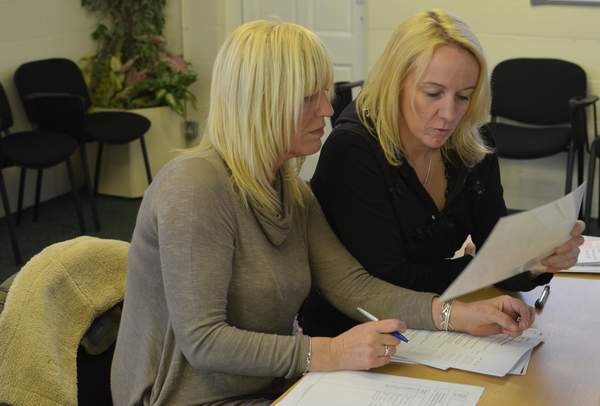 Two ladies from Treehouse Care completing a section of the Singleton Associates' Risk Assessment course.